Home › Everything › Books › When is a coach’s job done? When is a coach’s job done? This past week, one particular chunk really struck me, and I wanted to share it. I know there’s been a lot of distressing news coming out of the NFL recently, but setting that aside for a moment we can find a lesson about coaching. 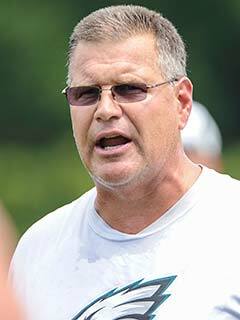 Jeff Stoutland, offensive line coach, Philadelphia. Good job by Troy Aikman giving Stoutland props for getting a makeshift line ready to produce in a big way. With Pro Bowl guard Evan Mathis and right tackle Allen Barbre already down (and regular right tackle Lane Johnson serving a four-game suspension for a substance-abuse violation), the Eagles suffered another body blow on the line on the first series of the second half, losing Pro Bowl center Jason Kelce to an abdominal injury. But with neophytes at left guard (Dennis Kelly), right tackle (Andrew Gardner) and center (David Molk), the Eagles still churned out enough production—six scoring drives in 11 offensive possessions—and 379 total yards in the 37-34 victory over Washington. Stoutland, a coaching lifer, was Nick Saban’s line coach at Alabama until taking a job on Chip Kelly’s staff before the 2013 season. He’s known as a perfectionist who doesn’t like excuses. I love what he told the Philadelphia Inquirer’s Jeff McLane last year: “I learned from really, really good coaches when I was young. You know the one thing they all had in common—good coaches never get tired of coaching the same thing over and over and over and over and over. A lot of people are like, ‘You know what, I told you that like twice now, I’m done. I told you, now it’s your job to do whatever.’ I’m not satisfied. I’m a pig head. I’m like, ‘Until the guy gets it right and understands it, I haven’t done my job.’ ” He’ll need that approach with his line as beat-up as it is now. I just love that, and I know exactly what he means. When you’re coaching, it can become frustrating when you think you’ve covered something and your pupils don’t ‘get’ it. It can be tempting to think, “Well, it’s your responsibility to understand, now that I’ve covered it more than once.” But the job of a coach is to bring out the best in his or her team, and that job isn’t done if people haven’t reached their potential and grasped the lessons.